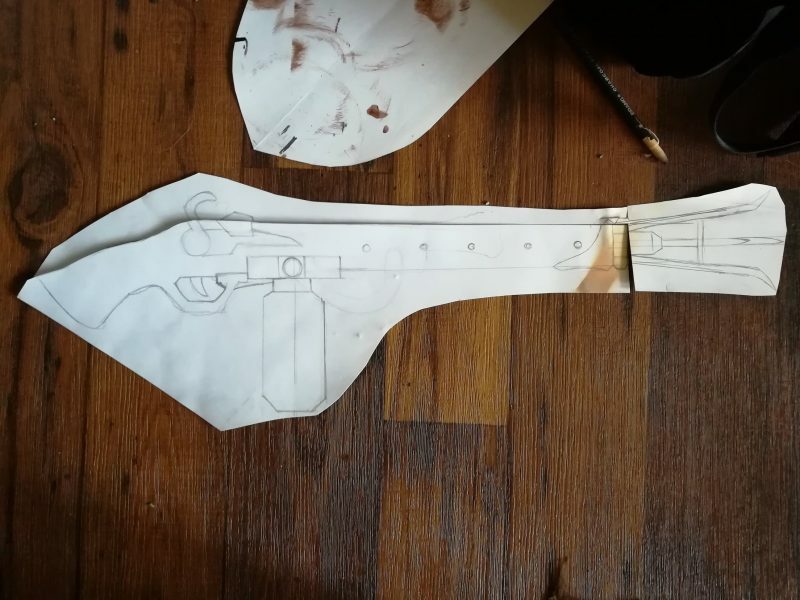 Nobody expects the Inquisition: Lets explore the leatherwork and weapon creation process of JAFantasyArt’s Inquisitor Adrastia! 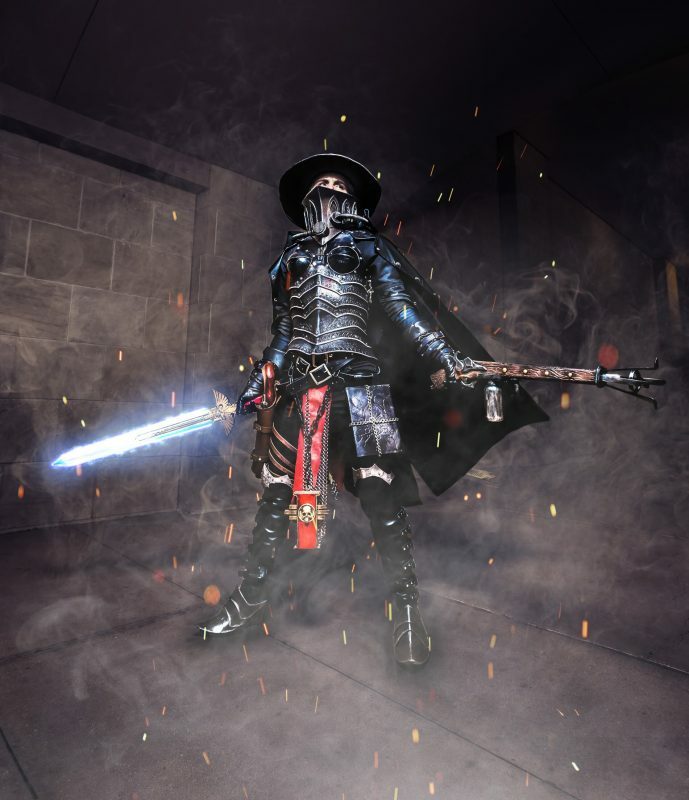 This week we dive deep into the Ordo Hereticus, taking a close look at the construction process for the Inquisitor Adrastia created by artist JAFantasy Art. This artist delves deep into her creation process and inspiration for us, so we’re doing a three part feature of her complete build and technique. 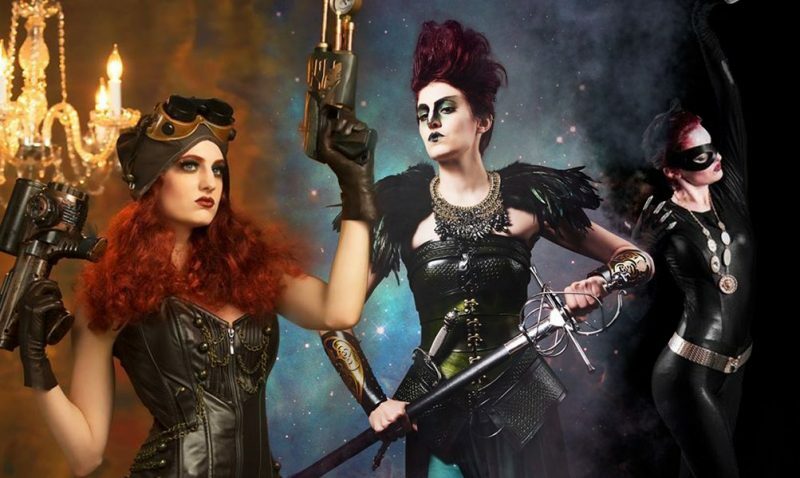 Check out her Cosplay and contact her for your next Warhammer 40k Cosplay project! The belts that form the base of the belts are 3 simple 1.5 inch leather blets that I cut, dyed, bevelled, and slicked from scratch. 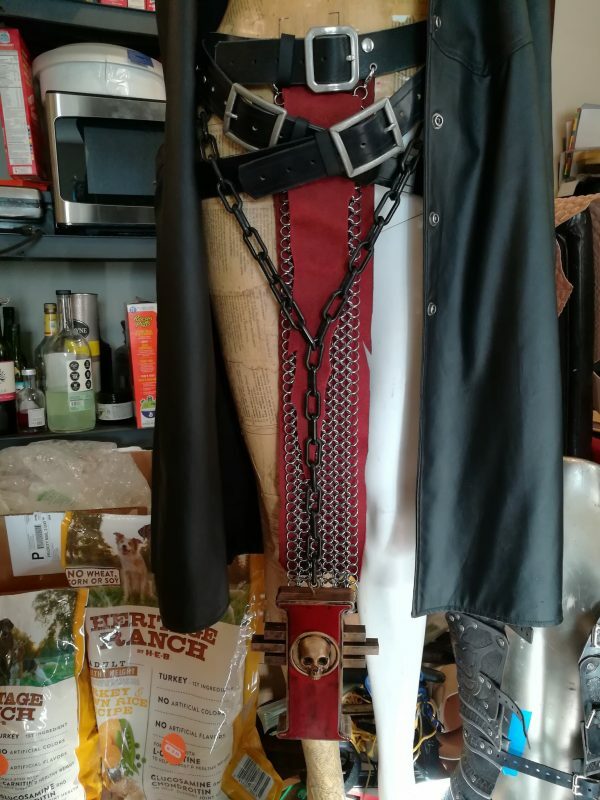 I needed a way to make two belts lay slanted on the hips without slipping or falling, so the plan was to rivet them to a waist high belt that cinched tight and rested on my hips. Once this was all put together, I could then build onto it, adding the accessories that went along with it. 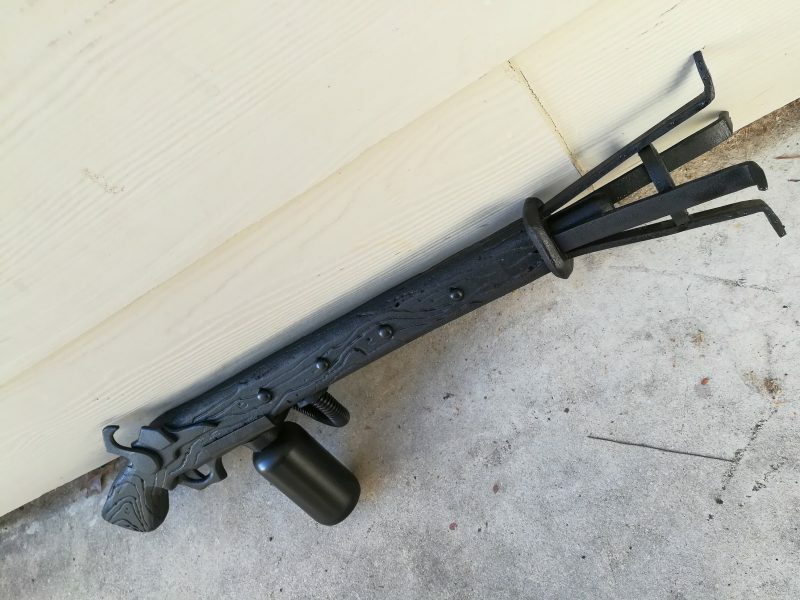 I had a pirate pistol prop laying around that worked well enough Adrastia’s sidearm. You don’t really ever see it in the game so I wasn’t too worried about making it from scratch for accuracy. 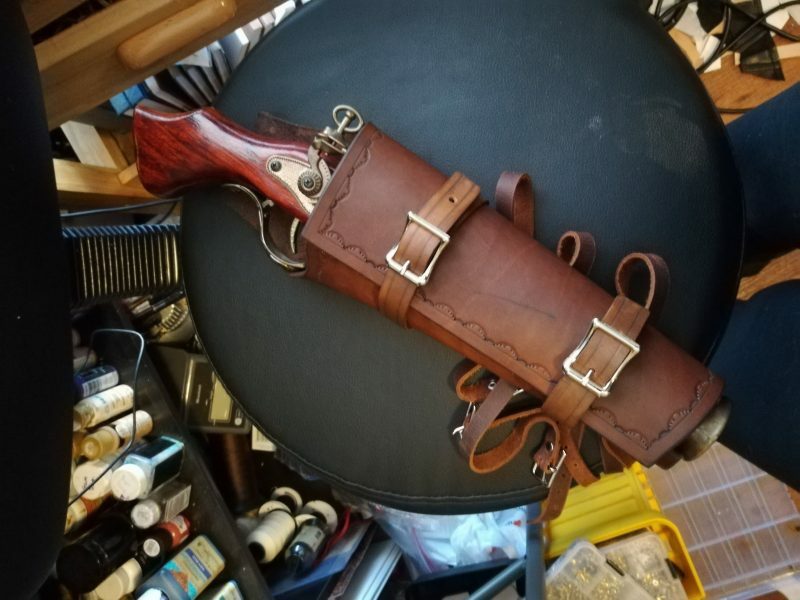 The holster and sword sheath was similarly vague, so I put a simple edge decoration on it and matched the brown to the reference pictures. The details of the shape and number of straps was the only thing I ensured was accurate to the design. The holster wraps around itself and has 4 leg straps. The chainmail is all hand woven by me, in anodized aluminum. The drapery behind it is hand cut in a red suede. The tricky part with assembly here was making it so the drapery hung from the center where the belt buckle was but could still be removed. 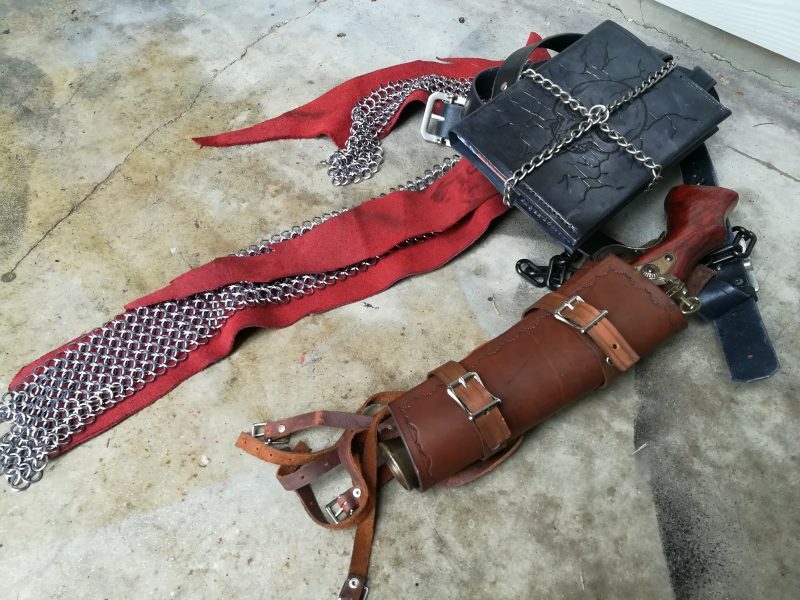 I had to rig a clip for one side of the chainmail and a snap on the suede, so it can come off and the belt can be unbuckled.The whole belt rig weighs about 16 pounds and I have to shimmy it up my legs to get it on if I don’t want to un buckle the two slanted buckles. Most of the accessories are made to be non-removable. 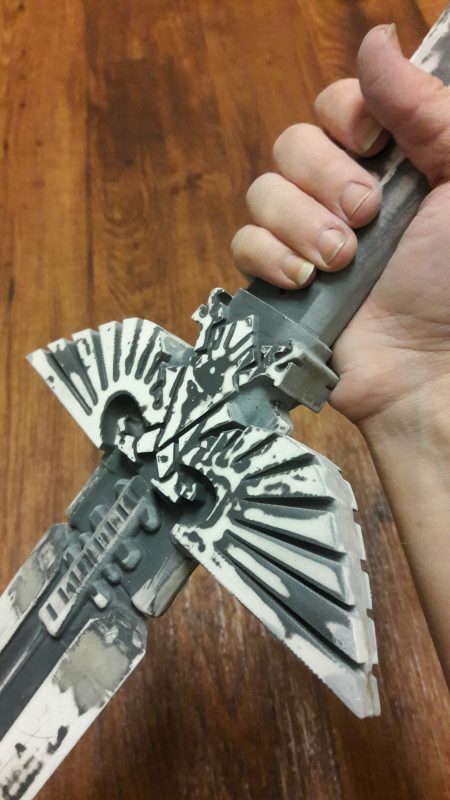 The Sword, inquisitor I, and the purity seals inside the coat are all 3d printed in PLA plastic. 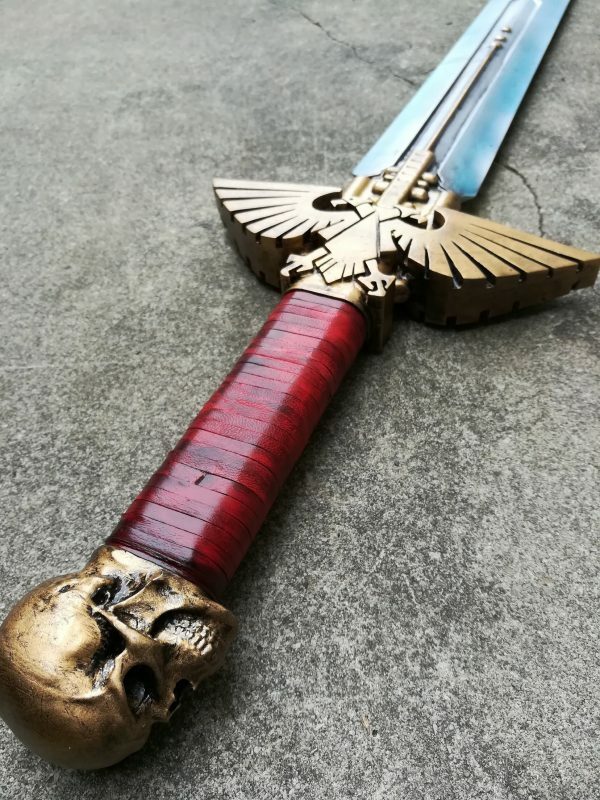 The sword alone was 10 pieces, took over 40 hours to print, and 18 hours to sand and paint. 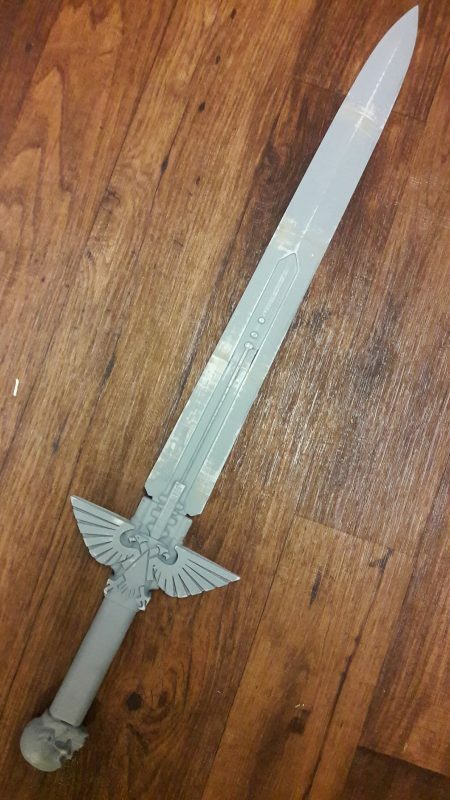 I did a lot of detail painting with an airbrush on the sword to give it a soft blue glow around the edges. It has two steel rods in the center for strength and stability, giving it a very realistic weight. 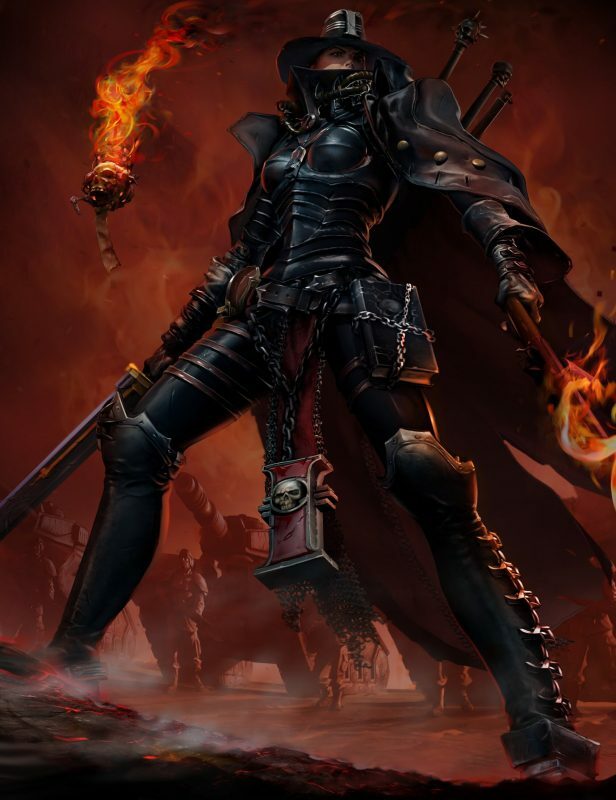 Adrastia has a tome on her left hip that allows her to cast her spells and wreck some chaos. I make leather book sleeves and covers all the time, so this was no challenge. 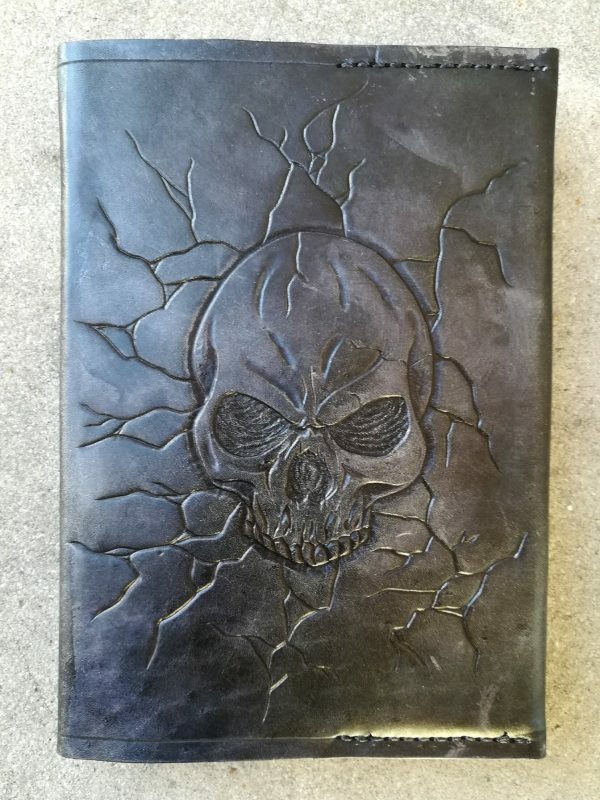 The artwork has a hint of a skull on the book cover so that is what I tooled on, with cracks cut in around it. 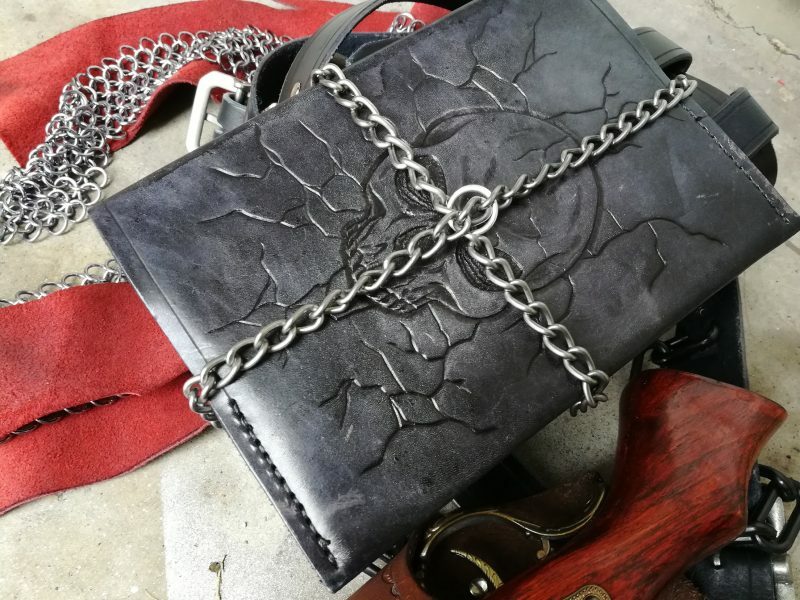 The chain around the tome is fairly heavy and I riveted leather straps to it so it stays on the belt. Once again, I had to get screenshots for good pictures of this thing. 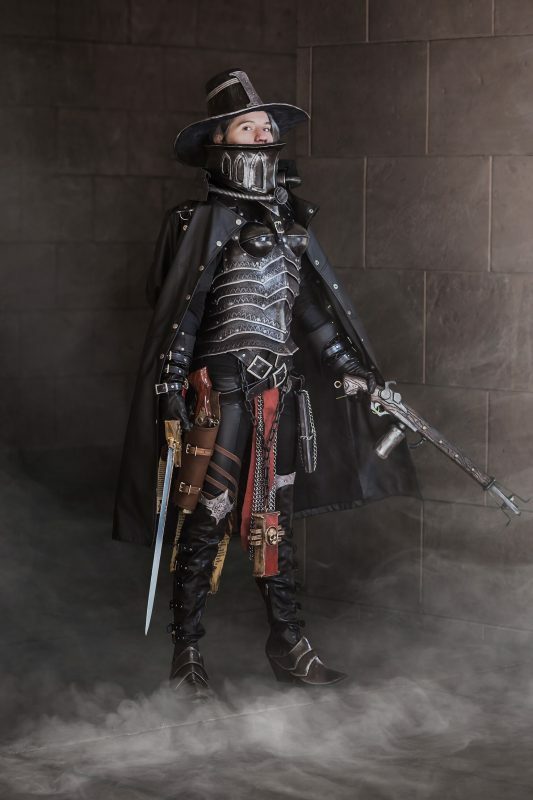 There is a miniature of an inquisitor with one of these that was an ok reference but the design was a little different. I started by drawing it life sized on poster-board and trace it onto foam. Three layers of foam cemented together forms the base and was then sanded down and rounded with a rotary tool and sanding. Once all sides were smooth, I added some small cut out pieces and wood burned a wood texture onto the length of it. The gas cannister is a smilple plastic bottle and the tubing is split tubing from the hardware store. We always joke that Lowe’s is actually a prop supply warehouse. 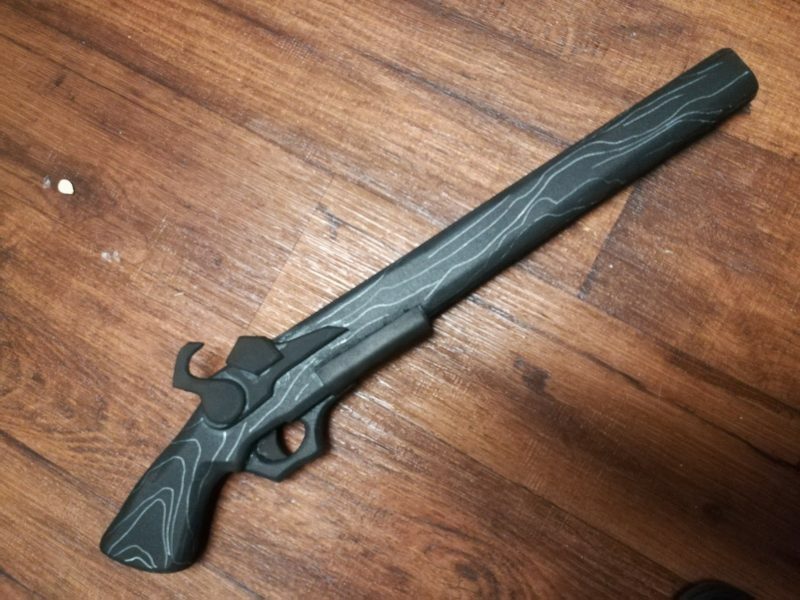 I plasti-dipped the whole thing to seal the foam and make the whole surface sohesive. Different textures make paint settle differently, so this coating helps bring everything together. The painting was a base of spray paint and some rub-n-buff wax paint with acrylic hand brushed details.